Enter below by clicking on the Facebook and Twitter buttons for your chance to win the following prizes! Personally, we think they’re pretty chic! 1 $25 Gift Voucher to Papernook.com! The Cuisinistas Club loves Paper Nook! 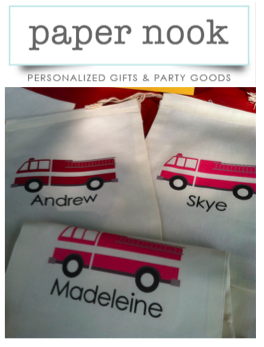 We ordered this month’s personalized Fire Truck themed party favor bags from Paper Nook and love them! They can be used as favor bags for any party. Paper Nook also sells lots of other personalized party items. Best of luck! Paper Nook specializes cute and simple personalized party goods and more. Our current products include a wide array of personalized note cards, wall prints, favor bags, printables and more. 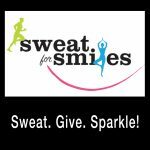 More products and designs are added often, so please bookmark us, become a fan on Facebook, or follow us on Twitter to see new designs. “What’s A Hostess To Do?” includes 313 clever ideas to make entertaining easy, 121 recipes for no-fail party food, and so much more. This handbook will come to the rescue with ingenious advice for the hostess. *Open to US Residents 18+ and older. Contest begins on Thursday 8/23/13 at 12:00am and ends 12:00am on Friday 9/13/13. Note: The Cuisinistas Club was not paid for this giveaway. The opinions provided in this post are our own. Paper Nook provided us with the products we mentioned in this post.